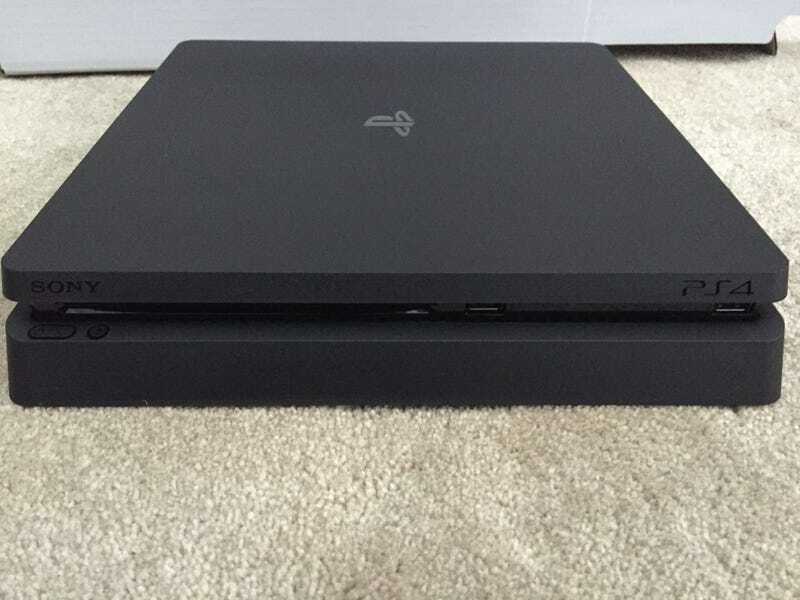 Apparent images of a slimmer, sleeker version of the PlayStation 4 have popped up on the UK auction site Gumtree (h/t NeoGAF), where a British seller claims to have obtained an unannounced model of Sony’s latest console. It’s going for only £295. We don’t know if this machine is real, but the pictures are compelling. It’s no great shock that Sony would be preparing a slim version of the PS4, as they’ve done for past generations of PlayStation hardware. This model, if real, looks to be a direct replacement for the older version, as the packaging simply says ‘PS4.’ It will compete with Microsoft’s Xbox One S, which launched earlier this month. On September 7, Sony will hold an event called the PlayStation Meeting in New York City, where the company will unveil their more powerful PS4, code-named Neo, which Kotaku broke news of earlier this year. A good guess would be that they plan to announce the PS4 Slim then as well, and that it will be available very soon.